People sometimes talk about how January 1 has been"changed". Originally, in the Roman rite, this was the Octave of Christmas. An old Roman (and Byzantine) custom is to surround major festivals with associated celebrations. So the Divine Maternity of our Lady occupied the Octave Day. 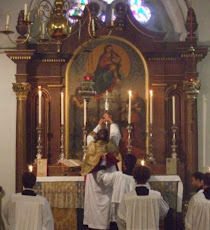 Look at the Collect and Postcommunion in the ancient rite. Because the dies octava of the Nativity is the Day upon which the Incarnate Word was circumcised, that event, as narrated by S Luke, became the the Gospel for the Day, and, as is normal, this Gospel was explained in the readings of the Third Nocturn at Mattins. Then it became fashionable for the Day to be renamed as "the Circumcision". But when this happened, the texts, for the most part, and in most places, were not changed. Simply the head-title of the Day. In the twentieth century, the Day was given back its more ancient title. This did not result in any changes in the formulae of the Vetus Ordo, because the texts were already mainly about the Divine Maternity ... as they had been for very many centuries. So there is no need for traddies to get excited by the thought that the twentieth century "abolished" the "Feast of the Circumcision". Nobody has had anything taken away from them! But perhaps there might be floating in the air just a weeny hint of embarrassment about the genital particularity of the historical event of the Lord's Circumcision. How to explain it to the Children? Will it bring a blush to the cheeks of Maiden Aunts, assuming that there are any of those left? I was on the point of calling such prudery "Victorian". Then I remembered that, in Anglicanism, the Day and its prayers and readings fixated on Circumcision right down to the second half of the twentieth century. And I wondered how fair it was to saddle the Victorians (or Maiden Aunts) with accusations of a prudery they showed no signs of having! I was under the impression, and please correct me if I'm wrong, that the properties changed in 1972 in the novus ordo. I imagine you mean 'propers'. There ere very few changes, except that, since Lauds and Vespers Novus Ordo have three psalms rather than five, some antiphons had to be omitted. And some splendid 'new' hymns, such as Corde natus, were introduced. While true that the propers did not change in 1960/1962, is it not also true that the title was altered by Pope S. John XXIII as a way to appease certain interlocutors, or is this another ecclesial urban legend? If the latter, was any rationale offered for the change in title? One could note that the Vesper psalms for the feast in the traditional Breviary are those used on feasts of the BVM as our two-thirds of those at Mattins. Pope S. John XXIII spent years working in Bulgaria, Greece, and Turkey, so was very aware of the emphasis by Orthodox churches on Mary as Theotokos. I would look to that for a motive to change the title of the feast. My Breviarium Romanum 1962 does not mention the Circumcision anywhere as a title. The name of the day is simply "Die 1 Ian. In octava Nativitatis Domini". Thus, it has been changed. I think the BR 1955 still had it as "In Circumcisione Domini" (or something like that). Luke mentions circumcision in one sentence. Surely it is not the same as the Presentation? On Sunday ( Sat anticipation) we had the Gospel I would expect to hear on Feb 2. Needless repetition?! The boys got circumcised on the seventh day, at home in the village. (Presumably they already had mohels for this stuff.) Then, later, the family went to the Temple for the presentation and buyback of the womb-opening son, and the mom got often got ritually cleansed at the same time. So no, it's not the same event. I thought I had made clear in my piece that the title was changed but not the texts. What should I have written in order to make this clear to yourself? Just asking! Circumcision is certainly a delicate topic! But the sad thing is I can no longer post a link on Facebook to anything on this blog, not just the "offensive" article. I don't know if that applies to others who might want to share Father's illuminating posts. A loss to Facebook readers indeed. I linked the two articles titled «The Anglicans are dumping the common ground» on Facebook, and they were banned by some automated mechanism, but I appealed and the posts were restored by a human. You have made that clear, and I agree with everything said in your post. My comment was a response to another commenter who was confused whether John XXIII did have a rationale behind altering the title. I simply affirmed that in my 1962 BR, the title of the Circumcision is nowhere to be found. It was not an exact answer of mine, and maybe it was unnecessary to even write my comment since it didn't offer anything new to the topic. My comment was not a correction of yours, and I do apologise if I have offended you. That was not my intention. This is only vaguely relevant, but I read some time ago of one of the claimed relics of the Holy Prepuce having been in England in pre-Reformation times, I think in Northampton or somewhere similarly unlikely. I can find nothing online to support my memory; can any of Father's learned readers help me out? I too have had Fr Hunwicke's posts removed from Fb but each time this has happened they've 'reversed the decision' after I protest that said posts are not in fact 'in violation of the Fb community standards'. At one point I suspected evil afoot but I expect that it's just neurotic algorithms. May I suggest, Mary Bordi, that you only need recommend to your Facebook 'friends' (that word always gives me the shivers when used in connection with social media) that you regularly and rapturously read "Fr Hunwicke's Mutual Enrichment" blog for in-depth briefings on all matters Catholic, ranging from the Church Fathers to Church Doctrine to contemporaneous commentary. Those curious who are inclined to exert a modicum of effort can search the wen for the blog by its title. Who needs lazy links? Jewish boys are circumcised on the EIGHTH day. Sorry for not factchecking; I knew better, and the 8th days are significant for Catholicism. Richard T: Many decades ago I read that the Relic was in the possession of Reading Abbey, presumably lost at the Deformation. Some edict of those times however forbad mention of it.